The Navratri festival in honour of Devi the Divine Mother is celebrated across the nation. Navratri exactly means ‘nine nights’ is one of the best celebrated Hindu festivals in India. In temple during the celebration of Navratri, a separate puja will be held on all ten days. During this period, Durga, Lakshmi and Saraswati are worshiped as three different manifestations of Shakti or Cosmic energy. The festival is celebrated all over India and the rituals of Navratri festival is different in different states.In Karnataka, it is called Dasara, in Bengal – Kali Pooja and in kerala it is known as Saraswathy Pooja. 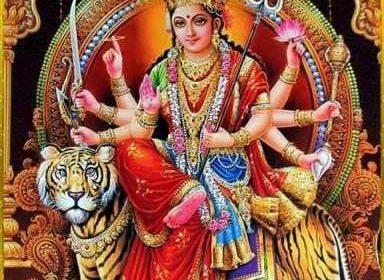 History of Navratri related with the victory of the revered warrior Goddess Durga over the evil buffalo demon Mahishasura. In nine days of Ashvin month (Seventh month in Hindu calender) Durga fight against Mahishasuran, and the last day that is in the Navami day Durga killed Mahishasuran. From that incident Durga decided to take vratham for nine days in every year of Ashwin month. Navratri is celebrated with this belief. The last three days of Navratri are most important.The last three days are known as Durgashtami, Mahanavami and ends with Vijayadashami which occurs in the 10th day of Navratri. Durgashtami is the day of ayudya puja. At this day all the tools or materials or books used for job or education are offered to god for blessing.For two days these tools and books are not allowed to take. So in Kerala, Durgashtami and Mahanavami days are holidays .On Mahanavami day peoples worshiped Saraswathi Devi. Regular pooja and prayers are conducted in the morning as well as in the evening of this day. The day next to Mahanavami is Vijayadashami. In Vijayadasami, after the puja, the books , tools and the study materials which are kept for puja are taken away from the puja room and this ceremony is called ‘Puja Eduppu’. It is considered as an auspicious time to start any new works. It also considered as an ideal day for starting education. So in various temples “Vidhyarambam” or ‘Ezhuthinu Iruthu’ is conducted in Vijsayadashami day. The day is also considered as a good day for starting any of the cultural activities like dance, music etc.